Soon after my arrival in Edinburgh I spend a few days at a youth hostel in Paris. There I met another Japanese traveler who told me about his experience working at farms in Switzerland in exchange for a daily wage as well as room and board. At that time I only had a vague image of Switzerland as a place known for fine timepieces, chocolate and beautiful landscapes. The notion of delicious meals, soft feather pillows and a decent wage caught my attention, so I decided to make Switzerland my next destination. 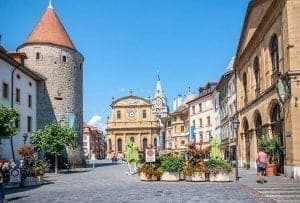 I didn’t have any particular destination in mind in Switzerland, so I rode around on the train checking out different stops until I liked what saw in the town of Yverdon-les-Bains, and decided to begin my job search there. In Yverdon-les-Bains was a disco full of people dancing to the music, so I figured it would probably be a good place to look for work. I approached an older man who looked like a manager, and in my broken English I told him I wanted a job. The man then took me to his car and drove me to a hotel on the outskirts of town. There the man spoke to a pudgy lady, and then he left, leaving me there alone with the woman. She only spoke French, so I couldn’t understand a word she said, but she seemed to be telling me I could work there at the hotel. After that, the lady took me to the laundry room to pick up a towel and bed sheets, and she then took me to a room inside the hotel where I could sleep at night. She showed me where the bathroom was and other parts of the hotel. Finally she gave me the key to my room. The next day I would start in the hotel restaurant washing the pots and pans, peeling potatoes and cleaning the kitchen. I was relieved that I had woken up in Paris that morning, but by the end of the day I had secured work and a place to stay. That night I slept soundly on the feather bed in my room. I didn’t know how long I would stay and work there, and I didn’t have any concrete plans at that moment. All I knew was that when I got some free time I wanted to get a bite to eat at the restaurant at the top of the mountain near the train station in town where I first got off.